Insufficient support and pressure points can cause foot pain. Given the connection between bones, joints, tendons, ligaments and muscles, the source of commonly occurring problems in the spinal area can often be found in the feet. Pressure distribution across the foot and joint angles is influenced by the individual foot shape and position as well as walking and rolling movements. Other potential negative factors include incorrect foot positioning, such as hollow, flat and splay foot. These malpositions already cause a change in pressure distribution when standing. Other differences that arise in joint angle positioning can also lead to an increase or decrease in muscle and joint pressure by shifting the leverage and points at which force is applied. Which components of a safety shoe can influence the effects? The sole construction can influence the parameters of pressure distribution and joint angles mentioned above. The shape of the sole affects the area on which the force has an impact and therefore also the pressure distribution. In the same way, joint positions that are adopted on contact with the ground can also be adjusted. This applies both when the foot is placed down and during the rolling movement when walking. Additional supporting or guiding elements are commonly incorporated into the sole structure. These serve to correct foot malalignments and control movement in order to ultimately prevent injury and strain damage. For example, to reduce overpronation of the foot and prevent adverse strain through this movement, medial supports are often attached to the inner side of the foot. Special torsion reinforcements are quite common in the metatarsal area as they reduce the ability of the front and back of the foot to rotate, thereby preventing injury. Ergonomic sole design also features in safety footwear in the uvex 1 product range. The sole has an optimised mid-foot torsion stability, flexible grooves to increase movement and a pivot point to support rotation in the front of foot. Overall, the design of the outsole supports the natural movement of the foot from the heel along the outer mid-foot all the way to the big toe. Without additional shock-absorbing elements, the body must, to a certain extent, absorb the forces that occur when walking itself. Consequently, the forces are distributed to areas of natural subcutaneous fat. The level of absorption is increased through adjustment of joints by bending more strongly when there is greater pressure. The higher the shock absorption in the shoe, the lower the energy requirements of an individual’s muscles to process the corresponding forces. This also applies to strain on joints and all the way up the spine. The additional material increases the surface area and thereby reduces the pressure on zones that are placed under extreme load. The type of material and shape of the sole determine the level of shock absorption and materials of different densities are applied. A greater level of shock absorption is achieved through lower density materials and a higher number of sole layers. EVA materials are often used in sports footwear, with the addition of gel or air pockets in some cases. Depending on the area of application, PUR or rubber soles are often used for safety footwear. The uvex 1 safety footwear range has a multi-layer sole system, with the mid-sole made from a PUR material with low density to provide optimum shock absorption. The structure and material of a safety footwear shaft have a major impact on the comfort of the wearer. In addition to fit and breathability, the supporting elements are also critical. Breathable materials are used to create a climate inside the shoe that is as comfortable as possible for the wearer. The aim is to wick away moisture coming from the foot and ensure good air circulation. For the best-possible result, this should occur across all layers of the shaft. Wearer comfort also comprises the prevention of friction and pressure points. Ways of achieving this include integrating a padded tongue or collar in the shoe, so that there are no hard edges or rough transitions. The uvex 1 safety footwear range includes a special construction to provide a certain amount of stability for the foot. There is an extension to the outsole which goes beyond the shaft and in this way provides reinforcement. The sole therefore supports the mid-foot and heel, which protects against incorrect strain and going over on the joint. A further important factor that influences the decision for or against a particular safety footwear model is fit. The individual shape of the foot again plays a role. In addition to the particular features and foot malalignments, this is above all determined by the length and width of an individual’s foot. The length of the foot is generally always catered for by standard shoe sizes. Some safety footwear manufacturers offer multiple width systems with the aim of adapting the interior of shoes to different foot widths. The selection is based on measuring the circumference of the ball of the foot at the height of the base toe joints and the width of the foot measured from the metatarsophalangeal joint (at the base of the big toe) to the basal joint of the little toe. 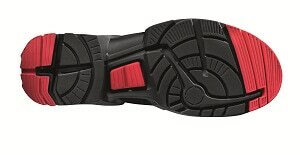 A range of different features, such as insoles that reduce or expand the inside of a shoe, are added to implement this system. Ultimately, the multiple width system makes it possible to cater for a broader range of different foot shapes. Overall, there are many options for incorporating ergonomics in safety footwear. As has been detailed above, safety footwear ranges today already include many ergonomic features. Nonetheless, constant innovation is taking place to ensure the best-possible protection and support is provided to wearers in their everyday working environment. Please do not hesitate to contact us with any questions on the right equipment in the work place and how to prevent damage and injuries. Who is the supplair . (provider)in Saudi Arabia? the distributor for the region is Kanoo. Who is a distributor in Spain?. Who is a distributor in Thailand? Linde (Thailand) Public Company Ltd.
the responsible person at uvex for your region is. He is looking forward hearing from you. I love uvex’s safety shoes, there is a lot of type and eye-catching. but please tell me, how to buy this product easily? I ask this question because uvex 1 8517.2 S3 SRC is very difficult to find in online store. And, why uvex don’t use a special online store that only sell uvex’s products? Thank you for your message. Please tell us where you come from. In general the uvex 1 8517.2 S3 SRC will be available from January 2015. There will be individual launch dates for each country where we are selling uvex safety footwear. uvex safety runs only in Germany and Austria an own online B2B-store. I come from Indonesia…and as much as I know that in my country uvex doesn’t have supplier…. i live in england and ure uvex 1 support boot 8517 s3 src looks great .Can you tell me who is going to stock them.If you dont have a distributor can i buy them from you and if so could you tell me how much they are, thank you D lewis. I need a distributor in usa for safety shoes, thanks for your help. The uvex safety group Germany does not sell uvex safety footwear or any other uvex personal protective equipment in the USA. The brand uvex is owned in USA by Honeywell Safety and is only in use for safety eyewear. How can I buy this? Is it possible to buy online? If I have to buy online is it possible trough the USA? Dear Nancy, Thank you for your message. Please contact our sales subsidiary in South Africa for any product and sales details. But it is not possible to order our products in USA (distributors or online). So it isn’t possible to buy trough Laservision USA? Do u have distributor in cyprus? I would like to ask about your outlet address in Germany??? Where I can buy uvex 1 8517.2 S3 SRC safety shoes? May we kindly contect you with our representative office in Indonesia. Our colleagues there will be happy to assist you with any further questions regarding the availibility of our uvex 1 safety shoe. Could you please help me to find the lightest and softest safety shoes from your range? I’ve got some health problems which make me troubles to walk in heavy unconfortable shoes and boots for a long time and I’m in need for safety shoes. I’ve already tried Uvex 6999’s on but they seems to be quite heavy as well. Our lightest safety shoe is the uvex 1. Let us know if you need more support or information. Best product in safety footwear, its actually a ” Health and safety shoe” no stress points the heels, my 12hr shift is not tiring on my feet anymore. There’s magic in the design of Uvex1 safety shoes. Great looks for a safety shoe. Been wearing Uvex1 for over 8months now, still looking new. I’ll advise people to get this safety shoe, “its the best away from the rest”, yes its the new generation of Safety foot ware. We will do our best to be “the best away from the rest” also in the future. Fatakk enables people to shop bata safety shoes, broach cutter and barcode scanner online. You have many products to choose from at best rates without worrying about the quality. 5 July Lethusang posted above about the goodness of ” Uvex1 safety footwear” the best safety footwear away from the rest”. I, Lethusang now import Uvex1 safety shoes to South Africa, . . . I’ve being wearing “Uvex1 model” for almost a year now, i love the lightweight, flexible and sporty looks. Best working shoe in eliminating fatigue, pressure points and discomfort on your feet. So impacted by the product I’m even selling it in my country. i hope some supplaire in Gujarat-Jamnagar. You can find best lightweight safety footwear on this site. We manufactures over-the-shoe boot used in concrete, mud, water, chemicals. Hello, who is a distribute the brand in Bulgaria? 16, Akad. Boris Stefanov Str. Kindly do you have a distributor in East Africa. Who is the distributor in Mexico? Many thanks for your interest in our products. I’m sorry to say: due to existing trade mark right matters, we don’t sell uvex PPE in North, South or Middle America. Please. Could you tell me the address of the distributor of your safety shoes in Spain. Thank you. Thanks so much for sharing your story, Mikaele! Hi we have to wear antistatic shoes where I work we issue people with insoles if requested and we also have people with orthosole insoles will the insole reduce the standard of the shoe as I am a bit concerned about this. Your concerns are absolutely valid, as non-certified insoles will void the safety classification of your shoes. You should contact your shoe vendor which insoles are safe to use with the shoes you have at work. I bought my first pair about a year ago. They are so comfortable I found myself wearing them any chance I could. I typically wore a 5 1/2 so I ordered a 6 and it worked great for me. I would recommend to anyone. Really nice blog. Got to understand a lot about the shoes and footwear. Hi, great thinking and memory you have shared here about the Safety footwear, personally me also a great fan of new soft and safe design shoes indeed. I have enjoyed the blog post a lot, thanks a ton for your true effort and time. Cheers! Thanks a lot for sharing knowledge about shoes. The shoes are looking so attractive and charming at all.